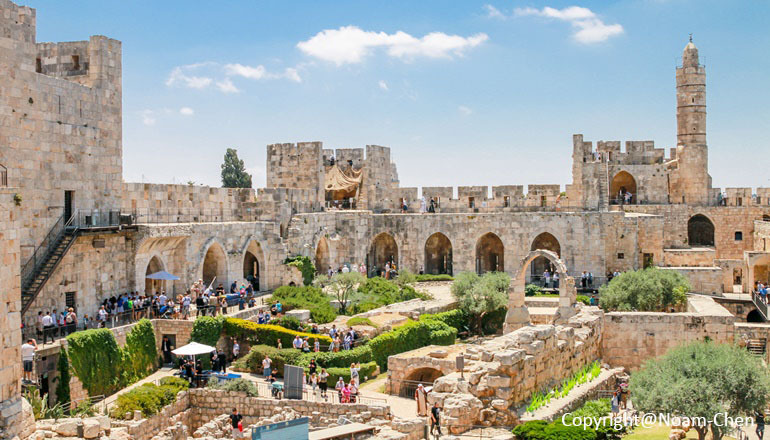 The Tower of David (also known as David’s Citadel) is one of Jerusalem’s most well-known sites and rests on the ruins of fortifications made by the King David. Today’s tower, located near the Jaffa Gate to the Old City, was originally built in the 2nd century BCE to strategically strengthen the city’s defenses, and was destroyed and rebuilt repeatedly over the centuries. The citadel’s museum beautifully brings to life Jerusalem’s history and offers changing exhibitions and activities for all ages. The courtyard houses important archaeological ruins, some dating back almost 3,000 years. The Tower of David is also known for its nighttime historical sound and light show, the Night Spectacular. Read more.